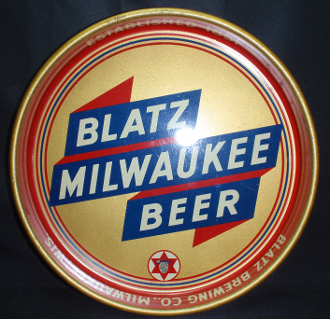 Blatz Milwaukee Beer Tray Established 1851 Blatz Brewing Co., Milwaukee, Wis. Marked on bottom front of tray is A.C.Co 71-A - 5. Tray has 13" diameter and 1 1/2" dept. Blatz Beer printed on outside rim in four places. Nice tray with bright colors ans some scratches, dents and rust. Edges show wear. Back has a blob of glue at top probably from display mounting. Nice tray for display.